Funny, Iraq's not much in the news anymore, is it? I heard Michael Graham interview Ralph Peters yesterday about the media blackout on the demonstrated improvements in Iraq. You can read about it at Peter's recent column in the New York Post. He's got all the news you won't be reading in your newspaper or hearing about on the network news. There's lot of good news over there, there's been a tremendous turnaround in the past eighteen months or so, since the surge in American troops. More reports on Iraq at Michael Graham's blog. 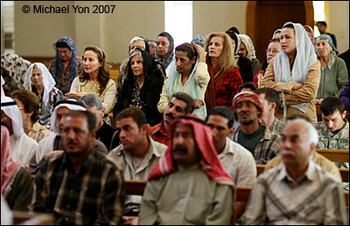 "Come Back to Iraq, Come Home"
"Today, Muslims mostly filled the front pews of St John’s. Muslims who want their Christian friends and neighbors to come home. The Christians who might see these photos likely will recognize their friends here. The Muslims in this neighborhood worry that other people will take the homes of their Christian neighbors, and that the Christians will never come back. And so they came to St John’s today in force, and they showed their faces, and they said, 'Come back to Iraq. Come home.' They wanted the cameras to catch it. They wanted to spread the word: Come home. Muslims keep telling me to get it on the news. 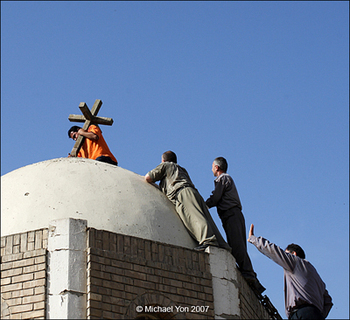 'Tell the Christians to come home to their country Iraq.” "
Sign the Petition - Support the Surge! "We, the undersigned, call on our national leaders and fellow citizens to resist calls for a premature withdrawal from Iraq and to support America's troops under the new commander, Gen. David Petraeus, as they implement a bold new strategy designed to bring a successful completion to their mission." Other good links there to support the troops, including Spirit of America, Fisher House, and Soldier's Angels. 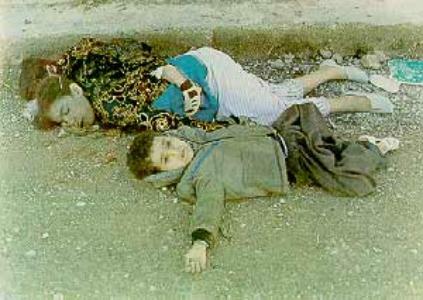 Thousands of people are reported to have been killed and many others injured in a poison gas attack on a Kurdish city in northern Iraq. Up to 20 aircraft, said to include Iraqi Migs and Mirages, were seen overhead at around 1100 local time in Halabja. According to experts, the chemicals dropped by the planes may have included mustard gas, the nerve agents sarin, tabun and VX and possibly cyanide. The attack on Halabja, which is about 150 miles (241km) north-east of the Iraqi capital Baghdad, is the latest in the Iran-Iraq war and follows its occupation by Iranian forces. .... Eyewitnesses have told of clouds of smoke billowing upward "white, black and then yellow"', rising as a column about 150 feet (46 metres)in the air. Figures for the final total of dead range from 3,200 people to 5,000. Between 7,000 and 10,000 are believed to have been injured in the massacre, which became known as "Bloody Friday". Is Saddam Hussein dead yet? Perhaps, Jules Crittendon of the Boston Herald thinks he may be dead already. "MSNBC citing a U.S. military source reports the Iraqi government has asked for Saddam to be turned over to their custody so his sentence of death can be executed by Sunday, before the start of Eid." Please read Crittendon's column, very moving. Iraq the Model writes that "the year 2007 will definitely be without Saddam walking the ground....It's going to be a long night but it looks like the morning will bring the news Iraqis have long waited for…." UPDATE: I don't know why the execution was carried out on Eid-al-Adha. That seems so unneccesary, a slap in the face to somebody. Contrary to the critics, I doubt that the U.S. government had anything to do with the timing, it was an Iraqui court and judge who decided on the sentence and the timing. A commenter at Gates of Vienna was very angry about the timing, her comment is here. Dymphna of Gates of Vienna says "I find the American cooperation on the timing of this, whether through ignorance or a wrong-headed (again) policy of hands-off at just the wrong moment, disturbing in the extreme." "hristians are living a terrified life in Mosul and Baghdad. Several priests have been kidnapped, girls are being raped and murdered and a couple of days ago a fourteen year old boy was crucified in the Christian neighborhood Albasra." Good Lord. Will the barbarism never cease? Fr. Iskander was kidnapped earlier this week, his captors demanded $350,000 in ransom and that his church apologize for the Pope's recent remarks at Regensburg. This past Wednesday, his body was found outside of Mosul, "His arms and legs had been severed and arranged around his head, which rested on his chest." I'm speechless on that one. Pray for all those famillies. Moving this up, got a special request here. Please send stuff NOW so it arrives before July 4th! We have a request from Fr. Marc Bishop, Marine chaplain from Billerica, MA stationed in Iraq. He's requested the following items for the troops at his base: 4th of July decorations (no fireworks), Nerf balls, frisbees, whiffle balls and bats, ring toss, any outdoor games, Granola bars and snacks, powdered drink mix (Gatorade or Tang), current movies on DVD. CARLSON: Don’t you think we ought to wait until the investigation is done and we know what really happened before you start calling for defense officials to resign? HOOPER: Well, first of all, I think it’s pretty clear what happened. There have been no reports refuting the allegations of a massacre that I’ve seen. CARLSON: Now we don’t know what happened. The military has not commented publicly on this, as you’re fully aware. It could be that the stories we have seen in the press are either inaccurate or at best incomplete. Don’t you think, like the rest of the country, you ought to slow down, take a deep breath and find out what happened before you start weighing in, in ignorance? HOOPER: I think there have been enough eyewitness reports — really bone-chilling reports of what happened, and even from soldiers who were involved in the incident or in the clean-up of the incident to determine that something happened there. And this is just the straw that broke the camel’s back. CARLSON: What do you mean, something happened there? That’s good enough for you? You’re a — you’re a public policy organization and “something happened” is good enough for you to just weigh in and call for someone’s resignation? Please. HOOPER: First of all, we’re Americans. We’re concerned about America’s image in the world. Abu Ghraib, Guantanamo, the — all the things that have happened in Iraq and Afghanistan and different places in the Muslim world. These harm our nation’s image and interests. We’re concerned about it, and we don’t want it to continue. CARLSON: But you’re assuming that American soldiers killed these people in cold blood. You don’t know that, but you’re implying it. Does that help America’s image abroad? I don’t think so. HOOPER: We — we protect the reputation of our armed forces by holding them and their commanders to the highest standards possible. Go get, 'em, Tucker. Not the first time that he has refused to accept CAIR's nonsense. And as Andrew Whitehead of Anti-CAIR notes, " CAIR does not have the credentials or credibility to call for the dismissal of a county dog catcher, let alone the SecDef ..."
"This current campaign by the US is an interesting one. I'm not at all sure that it will matter much in terms of actually reaching any of those we're trying to persuade. But at least it represents that someone on our side is thinking a little outside the box. And it's true that in honor/shame cultures, looking ridiculous is one of the worst things that can happen to a leader such as Zarqawi, who clearly prides himself on appearing to be the meannest, baddest man around." "Parker’s and Stone’s special gift is to see the pompous, the absurd, and the self-important through the eyes of the young and to caricature these with Chaplinesque comic sensibility. The Middle East — where there is plenty of pomposity, absurdity, and self-importance — is a place where satire and ridicule can be particularly powerful weapons, especially with young people." "In World War II our most talented writers, directors, and actors helped the war effort. This time around we might similarly challenge young, creative Americans who understand the streets of the Middle East, the humor of the young there, and what forms of ridicule could really work against the Baathists, the Shiite theocrats in Tehran, al Qaeda, and the Wahhabis." The Al Qaeda blooper video seems to fit the bill. Whoever put together that video, more please! Posting this again, because the soldiers need our support. Father Marc, a young priest from St. Mary's Parish in Chelmsford, was sent to Iraq this past January to serve as chaplain for a Marine batallion. He's requesting care packages for his soldiers. The following items would be appreciated: shampoo, body wash, shaving cream, Mach 3 razors and blades, toothbrushes and toothpaste, deodorant, foot powder, sunscreen, insect repellant, new-ish DVDs, magazines, eye-glass cleaner, eye drops, Tic-Tac mints, Slim Jims, Pringle potato chips. Religious cards and medals also welcome. You have to complete a customs declaration form. If you've been wanting to support the troops, here's a very direct way. Thanks! Michelle Malkin has a great entry on Bilal Hussein, an Iraqi stringer photographer for AP, who was detained by US military this week. Mr. Hussein's photos indicate a very cozy relationship with the terrorists, who allow him almost unbelievable access. How did Hussein happen to be so close when an Iraqui election worker was executed in a busy Baghdad street in November 2004? This photo, BTW, won a Pulitzer Prize. Other photographers and journalists have stated that AP photos provided by Hussein and other Iraqi stringers appear to be staged. The photos Malkin has posted certainly look staged. AP has staunchly defended Hussein. This continuing controversy points out how naive the Western press is, at best. At worst, it shows that the Western press is complicit in aiding the terrorists and harming US efforts. Could it be that AP and the NY Times don't realize that the terrorists are waging a propaganda war, and they're helping? How amazing that our soldiers put their lives on the line to rescue people who hate them. The freed hostages (one British, two Canadians) have not thanked the men who saved them. (The fourth hostage was discovered several weeks ago ago outside of Bahgdad, in a beheaded state.) Some Christian Peacemakers they are. "The three peace activists freed by an SAS-led coalition force after being held hostage in Iraq for four months refused to co-operate fully with an intelligence unit sent to debrief them, a security source claimed yesterday. The claim has infuriated those searching for other hostages." "We make clear that if we are kidnapped we do not want there to be force or any form of violence used to release us." Perhaps that can be arranged. God bless the soldiers. "I do not believe a lasting peace is achieved by armed force, but I pay tribute to their courage and thank those who played a part in my rescue," he said. I saw this over at IWF. It's a spot-on essay by Sharon Tosi Moore, a major in the U.S. Army Reserves, published at The American Thinker. She compares how boys and girls fight in the schoolyard (directly vs subversively), and makes an analogy to the Global War on Terror. In a nutshell, the U.S./allied forces fight like boys and the terrorists fight like girls. If your junior high school memories are intact, you'll likely find this an apt analogy. Simple but insightful concept, methinks.